See map from Shimokitazawa Station here. We will return to Shimokitazawa Church of the Nazarene in June. Looking forward to singing with everyone at the First Saturday singing at Shimokitazwa Church of the Nazarene this Saturday, 5:00-7:00 pm. 詳細はこちら／Here are directions. Pardon my encroaching on this Sacred Harp page to post such anathema as The Beatles in shape notes, but I've always said if a song can be written in notes, it can be written in shape notes, and if you can get people to sing their music in shape notes, you'll have more people to sing your music in shape notes. One of our singers, Keiichi Ogawa, asked us if we could sing "She Loves You" in four-part seven-shape shape notes for a music festival in Shimokitazawa on the day of our July Christian Harmony singing, Saturday, July 7, and I answered the way my generous grandmother always answered: "Why not?" So, in that ecumenical spirit, I'm posting here the hard work of another singer, Hideyo Takada, who went to the bother of finding an acappella version of the song, and open source software (the almighty MuseScore) to transpose it into shape notes and generate synthesized audio files for each part separately and combined. If you'll be anywhere near Tokyo on July 7, we'd love for you to join us in Shimokita Square (north exit of Shimokitazawa Station) in the afternoon, and then at our regularly scheduled first Saturday Christian Harmony singing at 5:00. Just practice with the below links and at our June Christian Harmony singing, Saturday, June 2. I think we may just make history being the first people anywhere to ever publicly perform the Beatles in shape notes. Come make history with us! Golden Week is almost upon us, so come and sing with us on Friday May 4th in Yoyogi Park! While we're there, let's have a picnic as well, so please bring a little food and drink to share, and a picnic blanket if you've got one. Peter will bring cups, plates and chopsticks, so no need to bring those. We'll plan to meet at 12:00 noon on the bridge between the park and Harajuku station, and then go to find a place in the park where we can make some noise. If you're going to arrive late, that's no problem at all, but please message or call Peter or Tim to find our exact location. We'll plan to sing until 4:00, before perhaps moving indoors somewhere. If it rains, we'll meet at Peter's place (near Musashiseki station) instead. 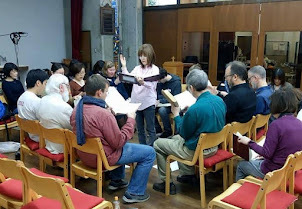 First Time at a Sacred Harp Singing? Ever since I heard this song, it's gripped me and won't let go. Here's a synthesized (by me) version of it, which I want to try in Japanese this coming Saturday at the Shimokitazawa singing. If you're going and you'd like to practice beforehand, you can go to the YouTube page, which will also have a link to the sheet music in shape notes. The tune is called Missionary Chant. It's not in any shape-note book, but like any music written in notes, the notes can be changed to shape notes, which, if you don't already know round notes, is much easier to learn. All the Japanese has romaji above it for anyone who needs it.